Being in business and growing it involves reaching more people every day. An online business has the potential to grow 24/7. You may have thousands of visitors seeing your webpage, but engaging them and converting them to your customers is completely different ball game. Is low conversion rate hindering the growth of your business? Read along to know how to improve your conversion rate. A healthy Conversion rate is a critical need for sustainable growth of your business. Growth in your customer base will result in increased revenues and profits. In your online business you bring prospects to your website using your favorite tools and tricks. The internet is full of advises on how to bring traffic to your website. But, as you already know, traffic is not revenue. You will have to put in a solid system to maximize the conversion rate. Communicate your business offerings clearly on the landing page of your website. Get your prospects interested in your offerings and encourage them to explore more. Provide relevant data to enable prospects to verify what you claim. Add trust factors and evidences, give verifiable references/testimonials to build trust in your business. Wiwitness is a Systematic Reputation Management Solution built to empower you with tools to better manage the trust factor. 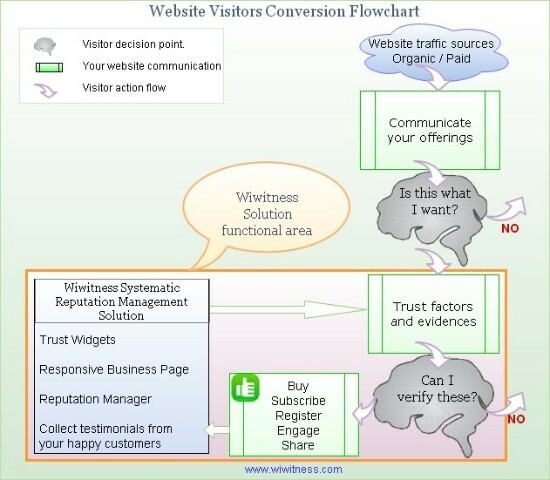 Wiwitness enables you to boost your conversion rate by providing System, Strategy and Tools to manage your reputation better. It helps your business achieve exponential growth by guiding you through a proven process for Reputation Management. Your website will get Wiwi trust seal after verification of the authenticity in your offerings. Dynamic widget engine that enables you to display verified trust factors about your offerings in your website. You can present trust seal and testimonials of your choice. Build your Wiwitness trust page with verifiable trust factors about your business using our responsive page builder. Easy to use dashboard to manage your Wiwitness account. Guides and tutorials to help you make optimal use of Wiwitness solution. So, why wait? Learn more about this all new solution and grow your business.